Jacob Appelbaum has something to hide: he is delivering this year's Elevate Festival Opening Speech. David Charles blogs about the events of the Elevate Festival. Jacob Appelbaum has something to hide. 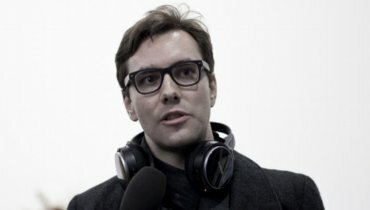 Jacob Appelbaum has acted as a spokesperson for Wikileaks. Jacob Appelbaum identifies as bisexual. Jacob Appelbaum has been detained twelve times by US government agencies. Jacob Appelbaum is delivering this year's Elevate Festival Opening Speech. An ordinary man, wearing black frame glasses over serious eyes, takes the stage. He could be anyone: a coder from Silicon Alley, a Shoreditch hipster-creative, a commercial architect from Berlin. His anonymous post-millennial disguise suits his work on anonymity. He is precise; the kind of precision that comes from believing that his work is both serious and most often ignored. Jacob Appelbaum begins by describing three aspects of openness that we talk about in completely the wrong way. 1) Private information. What does that mean, when the state and other states and even private companies have complete access to your private information? 2) Data protection. Data doesn't need protecting. We shouldn't be talking about data protection, but people protection. 3) Terror. When we talk about terror, we should be afraid, not of a small set of people outside the group, but a small set of people inside. The greatest terror that has ever existed in Europe was made up of white Christians, not Muslims or any other external threat. "We can't live in a post-privacy world until we live in a post-privilege world," Jacob declares. Some people say that we are living in a post-privacy world. What does that mean? Essentially it means that privacy is dead. Or at the very least that privacy is a hopeless case in this supremely connected world of instant data - and that we should embrace that fact. We should throw open the doors to our souls and bare all to all. But Jacob has a different vision of post-privacy. "It's not privacy that's died," he says, "it's liberty." He explains: "What we previously called liberty, we now call privacy." Liberty is the freedom of humans to look into their own minds and to decide how to act in the world. Liberty is personal and private. Therefore, the opening up of all that we call "private" to outside agencies, both friendly and foul, will necessarily mean giving up our liberty, our freedom to act based on private motivations. "Who here was surprised when they heard that Angela Merkel's phone was tapped by the US government?" The room drops a decibel of silence. "No one?" Jacob scans the room. "No one. Why? Because knowledge is power, so surprise means that you are admitting to not having that power. And no one likes to admit to being weak." If knowledge is power, then it follows that knowledge, like power, will pool up around certain privileged groups of people. Those people will stop at nothing to collect more and more knowledge and they will do anything to stop others from getting knowledge of their own. Is there a more fitting description of our security services? If they can get away with it and if they can afford it, then the NSA will spy on us. So the point is not to stop them from doing what they exist to do, but to make it politically and economically too expensive for them. "If we don't take action," Jacob warns, "then serious action can be taken against us and against those we love." He implores us to change the world from one where whole population surveillance is the emergent political phenomenon to one where it is used only against specific targets. And we must do the same economically: whole population surveillance is simply far too cheap to do in this networked age. And why should we care about the loss of privacy, the loss of liberty? "Because once we lose this, our liberty, then we no longer have a democracy, regardless of whether we still have a vote or not." Jacob fixes us with that bespectacled seriousness. "Voting doesn't make a democracy. The decisions taken by politicians come directly from the security agencies - they just pick one of the options presented." "The tin hat people," Jacob says, "the really paranoid people - well, it turns out they weren't paranoid enough." It sounds like a joke, but the only laughter in the cave is nervous. Jacob ends with a very personal appeal. "If there's anything you can do," he says, "to help get Ed Snowden asylum then please do it. There is no single person in the world who understands all these systems better and is willing to share that knowledge - at risk of his own life - than Ed Snowden." And there could not be a better example of the twin concepts of privacy and liberty than a man denied the latter for exposing the former.